We love destination weddings, and Savannah is one of the most charming southern cities to consider for a wedding celebration! Being from Charleston, it's easy to see how we feel right at home with the historic details, incredible food, and gorgeous coastal views. Nettie + Mitch chose Savannah as the backdrop for their celebration, and it did not disappoint! The Westin Savannah Harbor was the venue chosen for their reception which overlooks a gorgeous waterfront view. Ben was commissioned to capture the details of their reception as they shared their first dance, surrounded by friends and family. 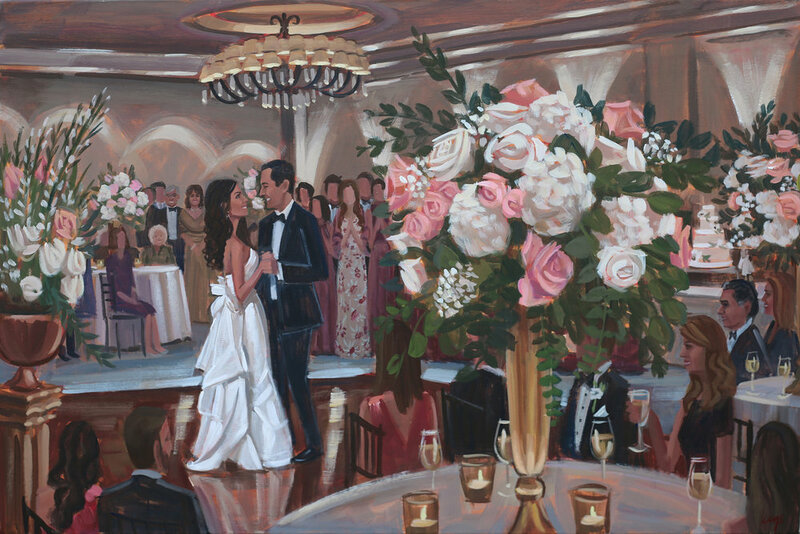 Throughout the planning process, we've just come to love their family ... and since their wedding, have even had the opportunity to paint for one of Nettie's brother, Charles! What an absolute joy to celebrate with this amazing couple!